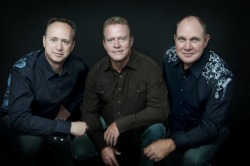 Three2U is Jon Buehner, Richard Talbot, and Joe Tenney. Together for 20 years, they are first and foremost friends in the truest sense of the term—three souls destined to sing the song of the heart. Their paths were brought together when performaing in a community production of "Les Miserables", but actually their trio was solidified when all 3 of them “really got their start” by singing together in their church choir. From that simple beginning many wonderful opportunities have unfolded over the years. Jon is an excellent guitarist, poet, and vocalist, and has performed since the 80’s, including the “Playmill” in West Yellowstone Montana. Richard is a talented producer, arranger, and a leading sound and studio engineer. He has performed in several productions, including leading vocals. Joe had the opportunity to tour several countries with the BYU Young Ambassadors, and has had the privilege of being the male narrator and now assistant director for the Mesa Arizona Temple Easter Pageant for the past 17 years. Three2U has shared their talents in many ways—from local and State productions to firesides, conferences, talent pageants and benefit concerts. They have been invited to sing for such events as the Arizona Temple gardens, and were invited to perform for Colorado Congressman Scott McInnis’ “Colorado Woman.” Most recently, they were invited to perform on the floor of the Arizona State Senate. In 1996 Three2U released a successful Christmas album: “Three Kings.” Immediately following, they began another project, but in life, things don’t always happen as planned. Each experienced significant challenges, including Richard’s fight with aggressive lymphoma cancer. As time passed by, all 3 had the opportunity to go their separate ways, but people’s paths cross for a reason, and as fate would have it they are still together. What was “on again, off again” twice, is finally “on!” The completion of their album “Deep Peace” marks a milestone for them in the “up and down” road of life. They have had 13 years to carefully choose every song on this album…each with a special message and meaning to them. It is their hope that this album might mean just a little bit more to you—as it now does to them. With its diversity, “Deep Peace” captures the varied moments and experiences of life. Almost a double CD, its cross section of songs provides “something for everyone.” Life can be difficult, even challenging at times, but it can also be a wonderful journey…wonderful beyond words or song. “Deep Peace” is the collaboration and the heartfelt “history” of 3 men who have become the closest of friends, even brothers! Three2U is thrilled to be able to share a little bit of this incredible “journey” through life with you. ​In 2016, Three2U commemorated their 20 years together as a trio. While recognizing that their time together in the last 2 decades has essentially been a musical ministry of their own, they again proclaim messages centered on Jesus Christ, including a new remake of "Let Him In". This milestone album, "Song of Christmas" is sure to be your new favorite Christmas collection.